Finally the koala has a keen defender in the person of Luke Foley, newly elected Shadow Premier of NSW who, for the time being is keeping the Shadow Environment portfolio. “Luke proved his bona fides as a genuine environmental warrior with his call on the ex-environment minister’s ridiculous claim that logging protected koalas, he pushed hard for the Federal koala classification of “Vulnerable” and was one of the few politicians to quickly call burning forest biomass to produce electricity “dead koala” energy,” said Susie Russell, spokesperson for the NCEC. “Unlike the politicians of the LNP Government, Luke Foley took the time to visit north coast forests on several occasions to see the damage ForestCorp have been doing in koala habitat. He has also inspected the route of the Woolgoolga to Ballina Pacific Highway Upgrade north of the Richmond River to Wardell which will inevitably lead to the extinction of a nationally-significant koala population. We have seen him take back this information to Parliament and through questions, motions, and various Parliamentary committees attempt to right the current wrongs,” said Lorraine Vass, President, Friends of the Koala and NCEC public officer. The North Coast Environment Council has worked closely with Luke Foley for several years. He has a genuine commitment to the koala and seeing it survive in the difficult climate ahead. 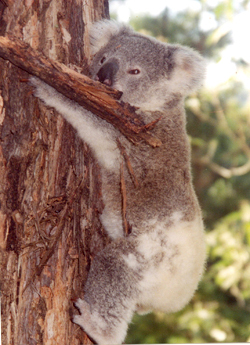 “Previous Premier Barry O’Farrell promised before the 2010 election to protect koalas, but koala protection on the North Coast actually went backwards with core koala habitat destroyed by logging in Royal Camp (near Casino), Boambee (near Coffs Harbour) and Wang Wauk (near Bulehdelah) State Forests. On the Far North Coast the review of environmental zones and overlays in local environment plans has weakened habitat protection and is still not resolved. “Premier Mike Baird’s enabling of burning native forests to create electricity and promotion of removing limits on logging intensity and of the requirement to conduct pre-logging surveys for threatened species will see much of the koalas’ remaining habitat on the NSW north coast destroyed. “The NCEC looks forward to an ongoing working relationship with Luke Foley. He understands that “logging (doesn’t) protect koalas”.” Ms Russell said. Following hot on the heels of yesterday’s speech by Prime Minister Abbott who called the logging industry “the ultimate conservationists’, the NSW Government today made a regulation allowing native forest to be burned in power stations opening the way for it to be classed as a ‘renewable energy source’. “The government wants environmentally conscious consumers to pay for the destruction of endangered species habitat,” said NCEC President Susie Russell. “It will also allow the already heavily subsidised mining industry to burn native forests and woodlands to generate their electricity and seek renewable energy credits. “COALition Governments have no respect for forests. They can’t see the trees for the wood. It seems they will stoop to any depths to pursue their anti-green anti-environment agenda. Claims that this will not increase logging and will be overseen by the EPA are farcical. “The Government is in the process of winding back a whole raft of forest protection measures in the name of efficiency. “The EPA has been shown to be a toothless tiger that has failed to act on evidence of breaches, and when it has been roused to action only manages to deliver pathetic slaps on the wrist such as letters or paltry fines. The community has no confidence in the EPA being able to regulate forestry. “There is plenty of scientific evidence to show that older trees store more carbon, provide better habitat, produce more water of higher quality, provide more nectar and honey, are more resilient to fire and have greater appeal to humans on aesthetic and spiritual grounds. “Everything this taxpayer subsidised logging industry is doing compromises all of those positive values. “This will be another nail in the coffin of the renewable energy industry that is being sabotaged by COALition Governments at both State and Federal levels determined to prop up an energy sector based on either fossilised wood or now, living wood,” Ms Russell said. “We are horrified that as the International Year of Forests draws to a close, we have a Government in Australia proposing to open up protected areas for logging” said NCEC President Susie Russell. “In response to the Victorian timber supply crisis resulting from decades of over-cutting and unsustainable practices, the Victorian Liberal Minister responsible is recommending the logging of ‘parks, reserves and water catchments’ 1 as well as reducing protections for endangered species, bringing in 20 year wood supply contracts and making taxpayers liable for any timber shortfalls. “The Victorian Timber Action Plan released yesterday is an ecological and social disaster,” she said. “What is alarming is that instead of seeing the writing on the wall for an industry that has failed to develop its own resource or respect the environment, the Victorian Government plans to head back to the dark ages and repeat the same mistakes by entrenching over-cutting, taxpayer liability and weakening environmental protection of key natural assets. “It is a recipe for ongoing conflict in Victoria’s forests. You would think they would have learned something from the NSW experience. In NSW where 20 year contracts have been in place for more than a decade, and despite lax environmental regulation, taxpayers are already paying compensation to timber companies. “The fight for the forests will be well and truly on again if the NSW Government follows suit and tries to open up protected areas for logging. We certainly hope they have more sense than to return to an era of protracted forest protest, ” she warned. “We ask that Premier Barry O’Farrell and Forestry Minister Katrina Hodgkinson rule out solving the timber supply crisis in NSW by opening up national parks and other protected areas for logging, or watering down what we consider to be the already weak environmental protection measures that apply to logging. “The timber supply crisis in NSW can only be dealt with by reducing contracted volumes, and reducing taxpayer liability. The biodiversity and climate crises can only be dealt with by protecting habitat, carbon stored in large trees, reserve connectivity and water catchment integrity. “The way forward is less native forest logging not more… Victoria is certainly marching backwards under Bailleau,” Ms Russell said.